The Washington Council of the Blind’s 2019 scholarship application period is now live. head to http://wcbinfo.org/2019-scholarship-cover-letter/ to learn more and apply. Thank you to all the volunteers, Crowne Plaza Hotel staff, vendors, and members who worked so hard to make this convention a success. Over 230 people attended. This year WCB is working with other disability organizations in our state to create law concerning talking prescription labeling. Our keynote speaker, Tony Stevens, ACB Advocacy Director, encouraged us to be strong advocates, to continue the work led by Sue Ammeter and Marlaina Lieberg. Slugger raises the ball to make an out. Spokane Lion Pride plays various organizations in the area. Will we see a Beep Baseball World Series in the Northwest by 2020? Beep Ball Clubs of Washington State (BBCWS) is currently taking nominations for board members. If you are interested simply go to beepball.org to get the details. If interested in playing or volunteering on a team, contact your local chapter. Sluggers Manager Kevin Daniel interviewed at the 2017 Beep Baseball World Series. 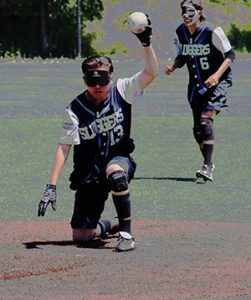 In the last couple years we’ve welcomed Skagit / Island Counties Council of the Blind, Wenatchee Valley Council of the Blind (WVCB), Beep Baseball Clubs of Washington State (BBCWS). With chapters across the state offering local activities and advocacy, you can make your voice heard. To find a chapter near you visit our Chapters page. Got questions about technology or managing diabetes? Check the Calendar of Events for more information.